For this month's Fun Fact Friday, we are going to discuss one of the lesser known benefits of Kinesiology tape: swelling reduction and accelerated recovery from bruising. Kinesiology tape, or K-tape, is probably more commonly known for allowing athletes to remain active while injured by supporting injured muscles and joints without limiting their range of motion. While it also helps with pain relief, speedier recovery of overused muscles, and enhancing strength in weak muscles, we are going to focus on improvement of swelling and bruising and illustrate this phenomenon with a case example. How does Kinesiology taping improve swelling and bruising? To understand how Kinesiology taping helps with swelling and bruising, you first need to know the role of the lymphatic system. The lymphatic system is a drainage system in our body that removes substances, such as excess fluid and infectious organisms, and is our body's main tool to help reduce swelling. When the tape is applied to a swollen or bruised area, the lifting motion of the tape creates a space between the top layer of the skin and underlying tissue. This then creates a pressure gradient between this area and surrounding tissue allowing fluid to move into the lymphatic system and be eliminated from the body. 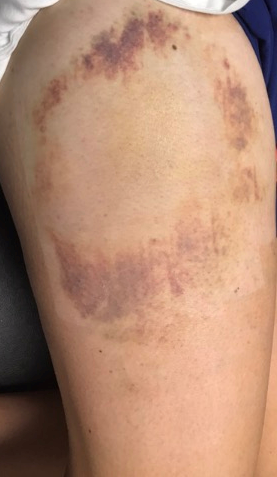 The following pictures will illustrate a case example of how Kinesiology taping can accelerate recovery from bruising and swelling. 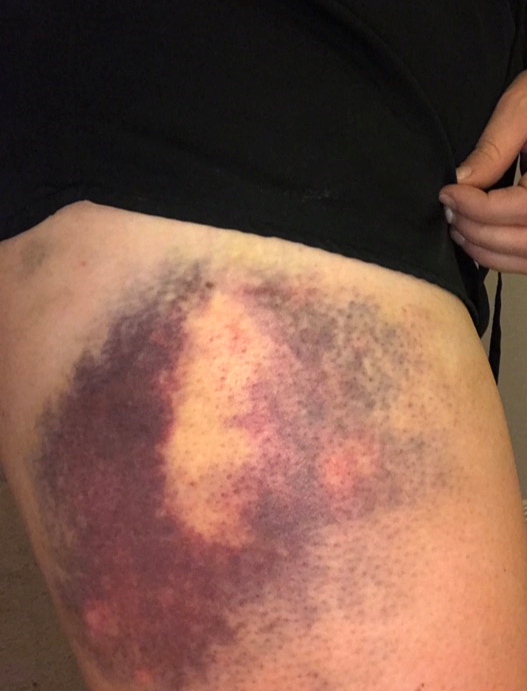 This fellow employee fell onto a rock, resulting in a large bruise on the outside of her right hip and thigh. (1 of 4) This first picture is on the 2nd day after the initial injury, before Kinesiology tape was applied. (2 of 4) This next picture represents the 5th day after the initial injury, after the first application of Kinesiology taping has been applied for 24 hours. 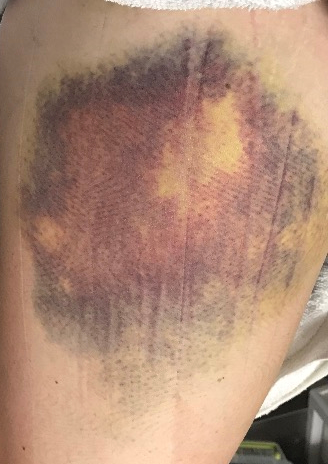 Notice the swirled pattern in the bruise from the Kinesiology tape. (3 of 4) This picture represents the 10th day after the initial injury, and after the 3rd application of Kinesiology taping. (4 of 4) This last picture is the 14th day after the initial injury, and after the 4th application of Kinesiology taping.